For everyone else that doesn't care about haikus: I paid off $40,000 in student loans while I was a band director (in a year and a half), and then quit my job to run this site. Yes, I'm THAT crazy person. I also do content marketing, so I basically run two separate but related businesses from my computer. If you asked me if I thought I would be doing this when I was standing on a band podium waving my arms at kids every weekday around 7:15 am…I would have laughed at you. This $hit is surreal sometimes. This is my first traffic report, so I'm actually going to give an overview of ALL the traffic I've had since day one (kinda…I'll explain below). I'll also take a second to direct your attention to my free and [email protected]$$ blog setup guide for anyone out there that wants to start their own blog. You may be thinking…woah that's awesome! Or…meh, what a scrub. It kinda depends on your perspective and experience with blogging and websites. Plenty of the big time personal finance bloggers get 400,000+ views per month. Some quit blogging before they ever get close to 10,000. It really depends on a lot of factors, but so far what I've noticed about traffic growth is that it's about TIME IN THE GAME. I had no idea what I was doing and didn't start using Google Analytics until February of 2015. Did I stop blogging? Were people tired of my $$$ site? Generally, the site has grown from when I started it to now. Some people might say that I've had some pretty killer growth, but it FEELS like it's been the slowest thing in the world. I'm super happy with how July turned out. I had 56,608 page views with no big features. Just steady daily traffic, which is actually more exciting to me than getting featured on Reuters or some other big site. The next question that I'm sure people would want to know is what my mix of traffic looks like right now. It's still majority social (which is pretty standard for newer blogs), but my organic (google), direct (people that type the site URL in their web browser), and referral traffic (traffic from other sites that link to me) have been catching up. I'm SUPER aggressive on Twitter and Facebook. I post several times daily on both platforms and have been very happy with my traffic from both. Pinterest is the next mountain to conquer. Just like with personal finance, you can never stay satisfied with where you are. Blogging is a long, slow (and fun) grind. I'd love to be where some of the mega-bloggers are right now, but I know it's a process that takes time and consistency. I'd like at least 2-3 more features on big $$$ websites before the end of the year. If you've been following me on Twitter, you've probably seen that over the last four weeks I just hit 75k views! Just gotta keep it up through August to knock #1 off the goal list. Supposedly this is the slow time of year for personal finance blogs, so I'm semi-confident that I can get to that 100k before the end of the year. We'll see…. Just as a side note, these goals are pretty superficial. Blogging is a weird game where the money that you make isn't always directly correlated with your traffic. But, I want to keep growing the site and keeping track of traffic is MEGA important. *Whew* First traffic report is in the books! If you're a blogger and want some [email protected]$$, personalized advice about growing your site, check out my blog coaching services! This isn't a question actually, but if you have been with me from the beginning let me know in the comment section! I'd love to say hi and a big thank you!!!!!! Solid work, M$M! I’ve been following the blog for a while now, keep up the good work. I like the ambitious goals, but with the growth you’ve seen lately I think you have a good shot at reaching them. I look forward to future updates! Thank you! I hope I can reach them haha. I’d like to do one every month, but it depends on how well this one performs first! Wow! That’s fantastic! I started up my blog just after New Year’s this year and I’ve only had just over 12,000 page views so far. Hey 12,000 is better than NO thousand right? Keep it up! As usual, you keep on killing it and inspiring the relative newbies like me, Bobby. Like you, I prefer to track my traffic on the months without any features or other big traffic boosters. Thus far, I have experienced organic traffic almost exclusively, save for one guest post which pulled in about 100 new subscribers. For the next few months, I’m trying to focus less on the numbers and shift my mindset to focus on raising the bar even higher in terms of quality content. We’ll see how that impacts growth. Yeah I definitely think you’ve got the right mindset with content. That’s really the only thing that matters and will help you grow. There’s all sorts of marketing strategies and social media tactics that you can use, but at the end of the day it has to be centered around what provides the best value to your readers! Great job on the progress! I’m still mystified by Pinterest but getting better at it (using Melyssa Griffin’s course). You going to be at FinCon in September? Thanks Colin! Yep I’m going! How do you decide what your “niche” is when it comes to blogging? I have so many people tell me I need to start a blog/vlog but I feel like it would be too broad. Any advice? Hey Morgan! The best advice I can give is just to write about something you know a lot about. I was really nerdy about student loans and paying them off quickly, so that’s how I got started! I think the biggest key to success is to not try to cast a big net in the beginning. Start off with a very specific topic and then grow from there. For example: I started off with basically just student loans, and then branched out to general personal finance and entrepreneurship from there. Much easier than trying to write/record about broad concepts in the beginning. Excellent stats! I wish I had your kind of stats now. But as you rightly said, it is a long and slow grind. Thank you! You’ll get there, just takes time. If you look at the first year to the second year there is a big bump. The more you do this and learn the more you’ll grow! Congrats on the pageviews! I’m a new reading and new blogger as of one month ago and from where I’m sitting those numbers look fantastic. I’m looking forward to seeing how your revenue report looks. Also, I think you’ve just inspired me to post a similar monthly review for my site, need to think about that this weekend. Thanks so much! I’m still trying to figure out if I’ll include all of my online income or just the blog. Currently I make $5-7k online every month. The swings have been a little bigger lately as the blog grows. Awesome job Bobby. I have been following you for about 6 months now and have learnt a lot. I have a sneaky suspicion you are going to get that 75k August goal this month and continue rising. This month I am hoping to get 15k views and really want to be featured on something big by the end of the year. Thank you so much for sharing, Bobby! And congrats on 75,000 page views! I’m confident you’ll make it to the 100,000 mark by 2017! I haven’t been here from the beginning, but I’m hooked now :)! It’s interesting to hear how other bloggers are getting traffic. I had a nice boost from Rockstar this month, but the majority of my daily traffic comes from Pinterest. Pinterest has been my focus, but I’m now starting to work on twitter and trying get over my love/hate relationship with Facebook and use it more. 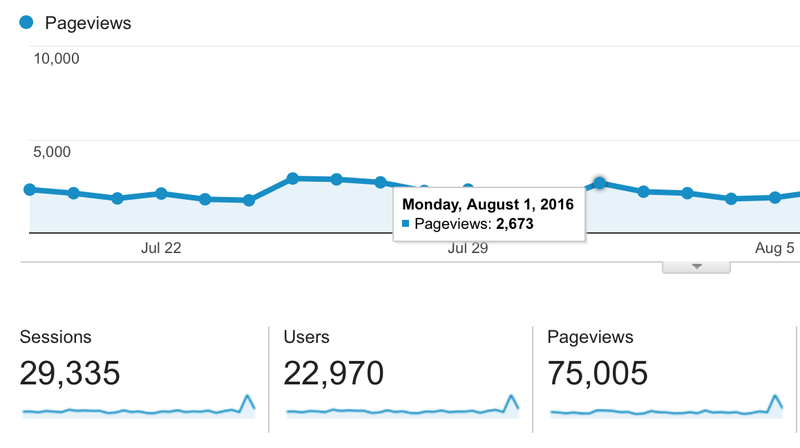 I’m 5 months in and sitting at 22k page views today. I haven’t worked on monetizing enough, so not making any $$ to speak of. Again – thanks for sharing!!! No problem! I hadn’t seen too many reports like this out there in the PF community so I figured I’d give it a shot! I really think I’ll get there too, from what I keep hearing I should expect to see a traffic bump in the fall. I didn’t like FB either, but lately I’ve seen a pretty big uptick in organic traffic compared to last year. I make most of my money from sponsored posts, blog coaching, and affiliates. I’m REALLY trying to boost my affiliate income, so you’ll see me get much more aggressive there this coming month. I can’t wait to see your income reports! *Testimonial* Bobby has coached me and I cannot even tell you how many hours he has saved me. I would have wasted so much time focusing on the wrong things… Great advice is key! Here’s to a successful 2016/17 for us all! I actually wouldn’t worry about these kinds of posts scaring away your regular readers. I’m not too terribly interested in blogging, but I read the entire article and all of the responses because it’s nice to know that this very well could be an option for me in the future if I wanted to explore the idea. Knowing that I can go to a website where I trust the information is comforting and I like to learn a little bit about anything and everything. But my focus is on Etsy and starting a business that way, but who’s to say that some of the skills that go into blogging couldn’t be used on Etsy and actually give me an edge because I was willing to learn different ways of doing things?! Keep it up! you always have interesting posts and I read them all. Thanks for all of the hard work and the amazing articles! Fantastic numbers, M$M! It’s hard not to imagine your blog as a big powerhouse and I’m confident that you can reach your goal of 100k viewers per month. I wish I can get 100k viewers in a year, ha! I’ve been following your blog a lot and can say that it adds a lot of valuable content to readers. Wow that fantastic numbers! I’ve only just started and struggling to get my first 100 views. Your content looks good, just keep going! This is not a quick business model at all! Congrats!! Question for you – How did you grow your Facebook community at the beginning? Now it grows pretty quickly because I run sponsored FB campaigns, but in the beginning it was only about 500 friends that liked the page! Obviously the sponsored posts help, but I also added a FB like box to my sidebar that does pretty well and lets readers like my page from the website. Highly recommend! Thanks for sharing your stats! As someone who is just 8 months in, its awesome to see what you can accomplish if you work hard and stick with it. Thanks again! You are doing awesome! I love your blog. What have you found that has been your biggest success in gaining a following and producing an income? We look forward to seeing more post from you! Hmm…biggest success is probably that I’ve really dug in and taught myself a lot about marketing and SEO. There is just so much information out there that’s free and readily available! I actually have an affiliate course that I’ll be recommending next month for learning SEO…super excited! The other thing is that I HUSTLED on social media and continue to do so. You’ll see in my first income report this month – I still make slightly more money on my marketing work than I do from M$M, but it’s catching up and I’m super excited about that! The blog income is definitely more passive, but they are both super fun. I actually enjoy what I do, which is rare nowadays haha!